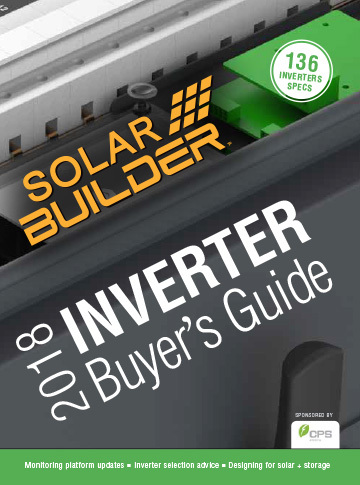 UPDATE: The 2019 Inverter Buyer’s Guide is located hereThe 2019 Inverter Buyer’s Guide is located here. At Solar Builder magazine, we receive a constant stream of news from inverter companies on the latest updates to their products and hear their perspectives on why they are significant. Many of these align with trends happening across the entire segment, while some are important points of distinction that present entirely different strategies and value propositions. With the FREE 2018 Inverter Buyer’s Guide, sponsored by CPS America, our goal is to present all of the latest and greatest news from the top inverter companies, note the trends and share procurement and installation advice from the manufacturer’s point of view. New products are divided into residential, commercial and solar + storage categories, and full specs on 136 inverters are located at the end of the guide. Hopefully all of this insight in one place will help you compare across brands and select the right inverter for your next project. Data Drivers. A roundup of inverter monitoring system trends in the residential market. Intelligent Design. Inverter manufacturers discuss how they maximize energy production, improve LCOE. Distribute and Conquer. We discuss new school ways to wire large-scale projects with CPS America. Time for Use? Inverter companies explain how to prepare today for storage tomorrow.